Flash is constructed as a fragrance which accentuates delicate white flower notes with a hint of spices and fruit. This perfume has got a divine flower fragrance. I love the packaging, size of the bottle and the design. Since using it a week ago, all my friends and colleagues have complimented me when wearing this perfume and asked what I am wearing. The older ladies love the fragrance but do not prefer to wear it. Definitely for the younger generations. Love it as a daytime perfume. I spray it on early in the morning and the fragrance still lingers in the evening. Love it! I would definitely recommend this perfume. This perfume makes me feel special all day long and I will definitely purchase this perfume again. Holding the box for Flash Eau De Parfum by Jimmy Choo made me feel as giddy as a schoolgirl with a crush. It’s a beautiful, sparkly box that implies there’s something “flashy” inside. The ethereal blue/lilac bottle is elegant and dreamy. The first spritz instantly makes me feel more feminine – like an ambitious, well put together woman. I feel so sophisticated, and I imagine wearing this into the boardroom and bowling over CEO’s. Of course it has been introduced as the “glitzy party scent”, so this heady floral perfume will enchant and delight all who come into contact with you on the dancefloor. The scent surrounds you for the better part of the day/night, trailing away to a creamy base that’s almost lickable! It leans towards the expensive side, but is undoubtedly glamorous. It’s a scent that completely envelops you, and is a bit heavy for my delicate nose. I would buy this for my supermodel best friend (if I had one), or any strong female that mingles with the creme de la creme of society. 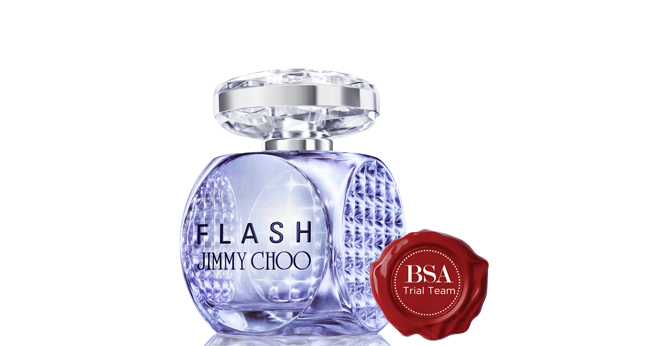 The new Jimmy Choo Flash gets the label “Amazing” just from the box. The box is a pure white colour, with fine glitter throughout the box. The glitter is meant to represent a million miniature paparazzi flashbulbs. Safely tucked away in the box is the beautifully designed crystal bottle. The bottle has a large crystal effect lid with a shimmering silver lining and spray nozzle, while the bottle is embossed with studs on three sides of the bottle. The light purple colour of the perfume enhances the feel of ultraviolet lights of a nightclub. As the top notes of Pink Pepper and Strawberry fade into skin, the stronger notes of Tuberose, Jasmine, White Lily, Heliotrope and White Woods come alive. I feel the perfume has a sensual strong scent, which is long lasting on the skin and doesn’t need to be reapplied all day. It makes me feel like I’m ready for the red carpet; it makes me feel glamorous. I really wouldn’t say this perfume has an age group because glamour doesn’t have an age, and everyone should be able to feel glamorous, however the perfume does have a strong scent so if you don’t like a strong scent, then this perfume might not be for you. I would really recommend you give this product a try as the scent is really unique and comes straight from the red carpet especially for you. I’ve fallen in love with the scent because the lingering woody scent has really grown on me. I would definitely purchase this perfume. I received my 40ml Jimmy Choo Flash Fragrance. I was very excited about testing it. I loved it and fell in love with the smell. I think it is wonderful for day and night use and also for every season. It is a sweet and warm fragrance. I am very impressed with the bottle it really is unique, also the sparkling packaging is perfect and very feminine. The only problem I had was with the opening of the perfume as I found it a bit difficult to open. It is actually really nice on my skin, it works really great with my chemistry. I am really impressed. The lasting power is great and even after I bathed or showered I could still get the smell. It really is different, interesting and very pleasant. I wore it to work and everybody complimented me on the smell of the fragrance, it really does make a statement. I think this is for any age group from the teens to the over 60’s. I love everything about this fragrance and would definitely recommend it to everybody because it really makes me feel good about myself. I’m really loving it and would definitely go out and buy it. The new JImmy Choo fragrance has a bold sophisticated scent. The packaging is what I absolutely love with a bright silver shimmer box and such a clever concept for a bottle, representing lights you would generally see at a photo shoot or night club. Thank you BeautySouthAfrica for selecting me as one of the members for your trial team. I’m blinging with my flash.